THURSDAY December 6th is our rescheduled Science Night 6:30-7:30! The Sciencenter is coming to Enfield! Short notice, but always a fun event. 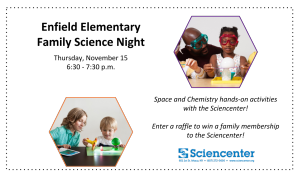 ← Science night this week!